You can click on Catalog covers to view entire cover if you have a fast web connection, or click HERE to view pictures separately. 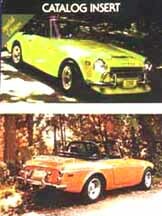 Our Datsun Roadster Parts Catalog is not available at this time. Some versions in 1983 also came with a 30 page insert; and in 1988 and 1992 a 90 page insert; all with the same cover; shown below. 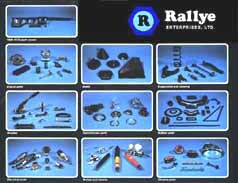 If you would like to get on the list to be notified when the next version of the Rallye Datsun Roadster parts catalog is released, please mail, or e-mail your name and postal mailing address. (Older versions are not available at this time). Currently the thousand or so pages on this website are occupying most of our free time; so I have no idea when we can release something in print. Also please include your roadster's "VIN" (car) number. It's found on the plate under your hood or on the dash of 69/70's, or on your registration. It will start with SPL or SRL. (SP or SR if your car is right hand drive). This is the most important item to know when dealing with parts or service questions, as the cars were titled by year sold, not by year "made." We'll keep it on file to prevent order slowdowns if you don't have it at the time or if we forget to ask. We suggest sending your regular postal service mail address; we may do a mailing or may just use the email addresses that we have for everyone. Let us know if your email addresses changes. If you need parts now, just hit the MAIN INDEX button above and you'll be taken to an page that will have blue link buttons for NEW or USED parts along with all kinds of other items. If you are inquiring about something not listed be sure to send your cars VIN number. What's a Vin number? "The "TECH INSERT," or "Owners Guide" as some have called it, was the catalog insert to our 1988 and 1992 catalogs. 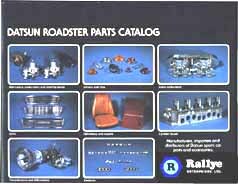 It is a 90 page booklet that had parts added since the last catalog was introduced, as well as magazine articles on the Datsun Roadster. There is a question and answer section that discusses most of the things that you need to know to keep your roadster running happily along. Many of the serious problems can be avoided for a tiny amount of time and money. This is not service manual, but with the knowledge you can gain from some time spent reading, you may be able to spend more time driving your car instead of repairing it. Why not learn how to prevent the problems before they occur? How does that old saying go? "An ounce of prevention is worth a pound of cure?" Reading "The 90 Most Asked Questions" and going through "The 35 Biggest Mistakes You Can Make" will allow you to prevent or solve most of the problems that can occur. Are there any good backhoe operators out there? I can always use suggestions on improving the work on this website.